The debate over Medicare’s future takes many forms. At its most basic, the issue is whether we can (or want to) afford Medicare. In addition, the debate is often inextricably linked to questions about financing—usually couched in terms of the burdens on current or future taxpayers. Too often these discussions take place in the absence of good information on how Medicare operates in practice and how its financing actually works. This series of issue briefs addresses key questions concerning the future of Medicare and how that will affect taxpayers and beneficiaries over time. 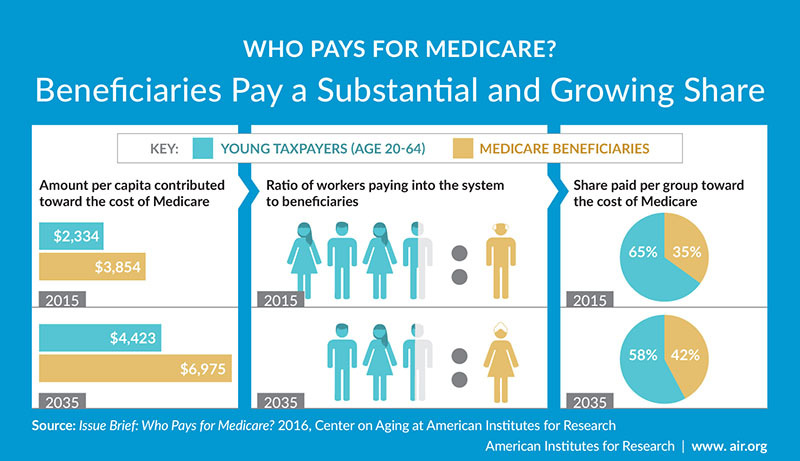 The first issue brief, Who Pays for Medicare?, examines on an annual basis how much taxpayers and beneficiaries each contribute to the costs of the Medicare program and how that will grow over time. It uses the basic principle that Medicare is a “pay as you go” program, funded each year by current taxpayers. And it recognizes that the program has multiple sources of financing and multiple payers of the various components. That basic measure is then used to examine how this will affect taxpayers in the second brief, How Much Will Medicare Costs Affect Taxpayers Over Time? The third brief, A "Lifetime" Measure of Medicare’s Value, addresses what beneficiaries will have paid into the system over their lifetimes and compares that to the value of the benefits they will receive. We are somewhat skeptical of the value of this measure; recent versions have been cited frequently, but often in ways that are interpreted incorrectly. Our approach properly aligns the financing sources with the benefits received—a flaw in other commonly cited versions. The final brief, Can We Afford Medicare?, combines the results to indicate where the measures differ in the information they provide. In particular, the differences between the pay as you go view and the lifetime contributions view are important to explore. Translating the findings of these measures into policy prescriptions requires further value judgments such as, what is an appropriate burden or what should beneficiaries be expected to pay. Will Medicare be affordable over time? Should beneficiaries be asked to take on more of the costs of the program as some have argued? And if so, how should those burdens be distributed? We have tried to frame the papers to inform this debate but do not expect that the results on their own are sufficient to settle the issue. Rather it is our hope that the debate on how the future burdens of Medicare should be distributed will be better informed from the analyses we have developed. Although Medicare was established as a “pay as you go” program—with current taxpayers contributing to pay for the costs of current beneficiaries—many observers of Medicare question what individuals pay over their lifetimes compared to what they receive in benefits. This brief takes a critical look at this line of reasoning and generates a lifetime measure of contributions and benefits. Measuring the contribution that Medicare and Social Security make to seniors is central to the debate over entitlement reforms. Understanding the role that these programs play is essential to understanding the impacts of various reform proposals. This brief explores issues related to the question of whether or not we can afford Medicare. A new series of papers by AIR reexamines a perennial policy question, particularly in an election season: Is Medicare sustainable? Led by Marilyn Moon, director of AIR’s Center on Aging and a former public trustee of the Social Security and Medicare trust funds, the papers conclude that several claims at the heart of most debates on Medicare’s future rest on faulty assumptions. Each year when Medicare’s Trustees report comes out, as it will soon, pundits and politicians fixate on the projection of when Medicare funding will be eclipsed by Medicare spending. But, Marilyn Moon asks, don’t we also need to know who pays for Medicare? What the taxpayer burden is and how much program participants pay? Whether we can afford Medicare as the U.S. population ages? This infographic illustrates key points from a series of papers by AIR, which reexamine the perennial policy question: Is Medicare sustainable? The papers, and the infographic, show that beneficiaries bear almost a third of the cost of Medicare, and that burden will rise as older adults increasingly stay on the job and continue to pay income and payroll taxes.